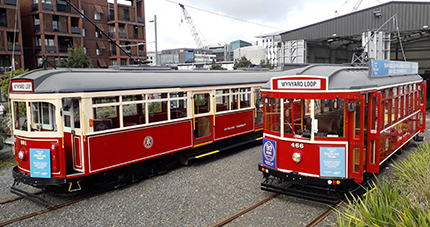 With a busy period of construction coming up in Wynyard Quarter, the tram operation has been suspended. Because of major road redevelopment, the tramway was only able to operate on a section of track between the Tram Shed in Daldy Street and Tram Stop #1 in Halsey Street on Sundays and Public Holidays. A gold-coin donation is being applied in return for an "All Day" ticket. The full loop and normal services were to return late-2019. Click here for more information on highlights along the Auckland tram route.